Last week Razorock had a few announcements a new shaving soap and something that caught my attentions a German 37 slant razor. I always wanted to try one but didn’t want to dump money into something that I might not like. 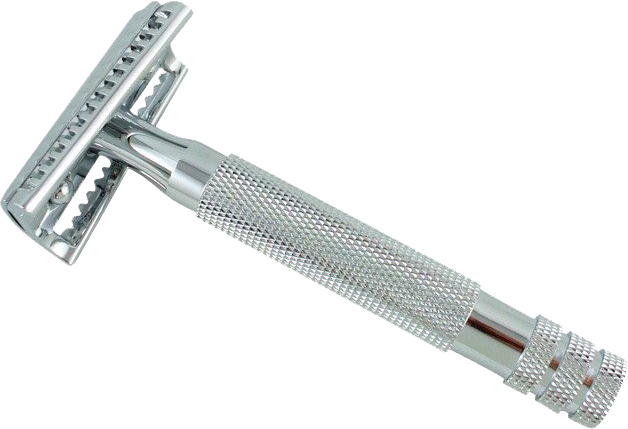 The best part about this razor it only goes for $20.00 so no worries if it doesn't work out. It took awhile to arrive because of the popularity of the product but it finally landed safe and sound. The razor was nestled in a black cardboard box with the words Classic Wet Shaving on one side and company’s logo on the others. Inside the box was a 5 pack of Derby Extra razor blades this reminded me of Men’s Soap Company they do the same thing with each shaving puck or tub. So after I removed the pack of blades there wrapped in tissue was the razor. I couldn’t wait to unwrapped it and once revealed I saw an assembled chrome plated highly polished 3-piece razor with bull dog handle just waiting for a blade. Derby Extras are find blades but my preference is Personna Blue. So I placed one into the razor and began to put it together. I thought this is odd why can’t I get the handle to screw back on to the post? But after a few times and remembering to back thread to make it catch I was successful. After investigating further I found this issue to happen to more than just me. No explanation or remedy has been given except to remind you that this is a $20.00 razor. I took the approached to this shave like I was using any other DE razor. I didn’t hold the razor any different or apply more or less pressure then I normally do. That being said slants in general are designed to be more efficient in removing thick, tough beards and less pressure is advised so take your time finding your own method that’s good for you. What I found was truly amazing. My shave was clean and close to perfect as I can remember. The slant really does make a difference and the best part of it is I didn’t have to spend much to find out. I’m not sure if another manufacture makes a slant as inexpensive at this one. So run to your computer and place an order I highly recommend it.